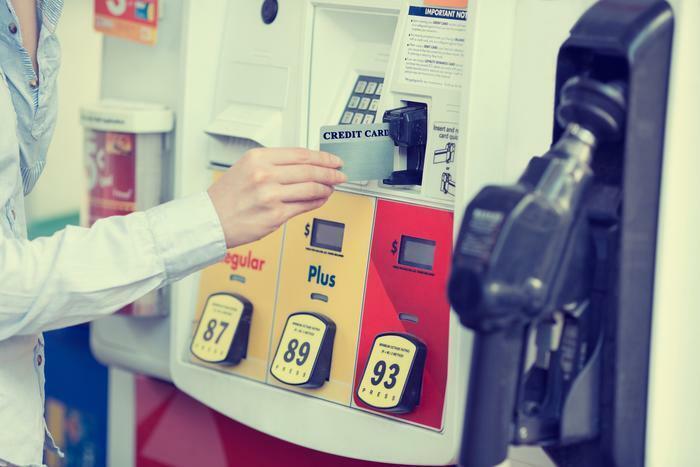 With gas pumps in the U.S. equipped with credit card readers, and stations requiring you to go inside and pay in advance if using cash, you'll save a lot of time when you fill up by paying at the pump. And with credit card cash back rewards programs, you'll save money as well as time. But choosing a credit card that rewards fuel purchases is important. Here are three that do just that. All three do not have an annual fee, which can significantly cut into an rewards you might receive. One of the best credit cards to use for gasoline purchases is the BankAmericard Cash Rewards Card. It pays 3% cash back on gasoline purchases – among the best in the industry – but has a few limitations you need to know about. First, you'll get 3% only on the first $2,500 in spending per quarter at gas stations, as well as supermarkets and warehouse clubs -- so purchases at supermarkets and warehouse clubs, which pay 2% cash back, will detract from your potential gas saving. If you use the card only for gasoline purchases, however, your potential cash rewards is $75 a quarter, or $300 a year. As an additional perk, the card has a 0% interest introductory period on purchases and balance transfers. But it should be pointed out that gasoline purchases should be paid off monthly and not allowed to accumulate in a huge balance, even if it isn't racking up interest charges. While it doesn't have a separate gasoline rewards category, the Chase Freedom Unlimited makes the list because it pays a generous 1.5% cash back on every purchase, including gasoline. And as the name implies, it is unlimited. There are no annual or quarterly caps. It's good for consumers who do a lot of driving all year round. There is a lot of flexibility in how you use the cash rewards and they never expire, as long as the account remains open. You get a $150 cash bonus after spending $500 the first three months after activating the account. It also has a 0% introductory period on balance transfers, but the balance transfer fee is 5%. The Blue Cash Everyday Card from American Express is another attractive option for gasoline purchases. It pays 2% cash back on what you spend at the pump. It also pays 3% cash back on spending at supermarkets, and 1% on all other purchases. The higher rates at gas stations and supermarkets, however, only apply to the first $6,000 of spending each year. After that, all purchases earn 1%. Since most consumers do most of their spending at the supermarket and gas station, a smart strategy is to have both the BankAmericard and the Blue Cash card. Use the BankAmericard only for gas purchases, earning 3%. Use the Blue card only at the grocery store, which will also earn 3%. Should you be paying with a cash-back credit card?